and How Can You Make it Work for You? 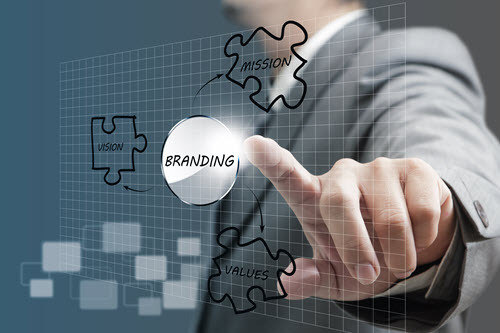 In this article, Dr. Frederiksen discusses branding and the value and importance of maintaining and creating a brand. If your firm has developed a strong, effective corporate brand, you already know what a powerful asset it is. But you may be less familiar with your employer brand—and its impact on your bottom line. In this post, I will share some thoughts on what exactly an employer brand is and ways that it can benefit your firm. I will also share some results from our recent research into the most effective (and ineffective) ways to communicate this special type of brand to the people who matter: prospective employees and recruits. Your employer brand is how your firm is regarded as a place to work. It can include general attributes, such as, “a great place to work” and more specific ones, “the most family-friendly benefits in the region”. Supporting your employer brand (usually laid out in an actual document) is a strategy that defines how you want to be seen in the talent marketplace and how you will create and maintain that reputation. My firm recently conducted research into employer branding. In our study, we looked at a group of more than 800 recruits and talent evaluators (the people who oversee their firms’ recruiting communication and advertising). Some interesting facts emerged. First, of the many ways that firms can communicate their employer brands (link to: https://hingemarketing.com/blog/story/employer-branding-strategy-for-professional-services-firms), several are over-utilized, while some others are significantly under–utilized. Knowing the difference can reveal some “hidden gems”—and thus, help you spend your advertising dollars more effectively. These are the communication channels that most firms tend to neglect, and they represent a great opportunity to get your message out to the individuals you want to think highly of your firm. Start by looking at some of the communication channels that many firms continue to use, even though recruits and influencers prefer to use other communication methods and resources to learn about firms. A quick review of the data reveals there are several “old standards” that no longer deliver the results. 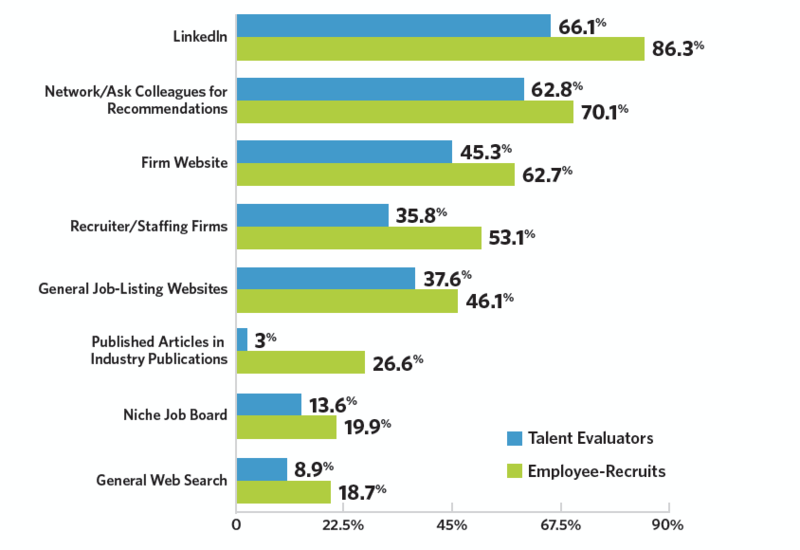 As shown in Figure 1, there is an interesting blend of communication channels that employers rely on far more than do the recruits themselves. For example, although more than a third of talent evaluators rely on job advertisements, only 14% of employee recruits do so. Job fairs have a similar discrepancy: almost 21% of evaluators rely on them, although only 9% of employee recruits do. Another finding may at first seem paradoxical. You might think that focusing on newer channels like Facebook, Twitter, and other social media would be a smart strategic play. But the data shows that, at least with these three choices, employee recruits are not as interested in them as the firms’ talent evaluators. The flip side of the data is even more revealing. Figure 2 shows the communication channels that appear to be the most under-utilized. Of these, three in particular stand out: LinkedIn, published articles in industry publications, and firms’ websites. 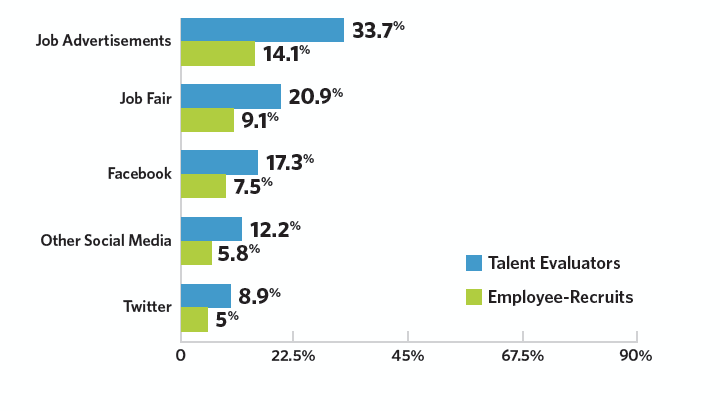 In each case, there is more than a 20% differential between how talent evaluators and employee recruits rely on the channels. That means that these channels represent the hidden gems of employer brand communication—channels where you can make your brand and presence known much more easily since most of your competitors are focusing their attention elsewhere. “Fishing where the fish are” may not sound like a ground-breaking strategy, but learning where the fish actually are, and not just where they used to be, is. Happy fishing! Dr. Frederiksen can be reached at: (703) 391-8870 or by e-mail to: LFrederiksen@hingemarketing.com.